SMART MISSILE (AUS) (Bay 2008-Stud 2012). 3 wins-2 at 2, ATC Todman S., Gr.2. Leading Aust. First Season Sire 2015-16. Sire of 200 rnrs, 105 wnrs, inc. SW Debellatio (WATC Sires' Produce S., Gr.3), I'll Have a Bit, Exocet, Sassy 'n' Smart, SP Aim Smart, Smart Coupe, Rocketeer, Smart Amelia, Smart Manoeuvre, Fromparis Withlove, Hair Trigger, Jericho, Mediterranean, Sacred Missile, Stephenstihls and of Masculino, Ahndras, Cadogan, Royal Missile, etc. SAINT PATRICKS DAY (c. by Excelebration). 2 wins at 2, A$93,900, in 2016-17, BRC Dalrello S., L, 2d BRC Catalina Sounds H., 4th BRC Sires' Produce S., Gr.2. Goldmine (f. by Manhattan Rain). 2 wins at 1200m, 1300m to 2017-18 in Aust. AMEXED (Pentire). 3 wins from 1600m to 2400m, A$245,135, BRC Rough Habit P., Gr.3, SCTC Caloundra Cup, L, 2d BRC Andrew Bensley No 1 in News H., Sequalo at Lyndhurst H., 3d BRC Bundaberg Distilling Company H., 4th BRC Grand Prix S., Gr.3. Digital Fortress (Savabeel). 2 wins at 1600m, A$128,550, AJC Patezza H., Ashcroft H., 3d MRC Norman Robinson S., Gr.3, 4th Victoria Derby, Gr.1. Danahere. 5 wins. See above. Hoban. 2 wins at 1100m, 1200m in Aust. Natchwhali. Winner at 1600m in 2016-17 in Aust. Legless. Winner at 2100m in NZ. I'm Excited (Paris Opera). 6 wins from 1800m to 3200m, NZ$75,115, New Zealand Cup Trial, Hawkes Bay Air NZ Link Trophy, 2d New Zealand Cup, Gr.2, CJC Sleepyhead H., Miller Bar & Cafe H., Hawkes Bay DB Draught Distance H., Taranaki RC Equinet International Welter H., 3d Banks Peninsula Cup, Reefton Gold Cup, 4th Hawke's Bay Cup, Gr.2, CJC Easter Cup, Gr.3. Danex (Danasinga). Winner. See above. Calm Crossing (Northerly Native). 5 wins at 1400m, 1600m, Levin Winter Cup, CJC Nederburg H., Video Village H., Hawkes Bay M & D Small H., 2d CJC Winter Classic S.H., L, Levin Winter Cup, WRC RFL Transport H., 3d CJC Winter Cup, Gr.3. El Caballero. 10 wins from 1200m to 1800m, 128,560Rgt., S$301,666 in Malaysia and Singapore, Selangor TC Class 1 H., Wilayah Silver Bowl, Valley Fame S., Singapore TC Moonee Valley Racing Club Trophy, Class 1 Premier H., Class 1 H.-twice, 2d Singapore TC Class 1 H.-twice, 3d Selangor TC Class 1 H., 4th Singapore TC Raffles Cup, L, Silver Cup, L.
RYAN MARK (Thorn Park). 8 wins at 1200m, 1400m, NZ$352,135, ARC Railway S., Gr.1, Rotorua RC Arawa S., Gr.3, Waikato RC Sprint H., L, Hawkes Bay The Desert Gold Club H., Swiss Ace Sprint H., 2d Hawkes Bay Makfi Challenge S., Gr.1, ARC Concorde H., Gr.3, Waikato RC Sprint H., L, Hawkes Bay LI Redshaw Memorial H., 3d ARC Concorde H., Gr.3, Hawkes Bay GR Kelt Memorial H., Gr.3. CALM HARBOUR (Spectacular Love). 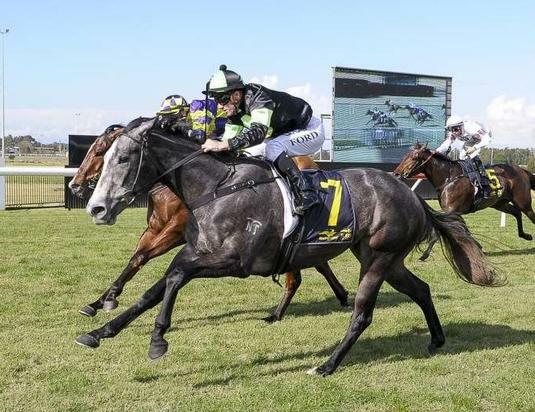 16 wins from 1200m to 2000m, NZ$376,685, WRC Thorndon Mile, Gr.1, Captain Cook S., Gr.1, Hawkes Bay Kelt Capital S., Gr.2, Russell's Akai Television S., Gr.3, Manawatu RC Awapuni Gold Cup, Gr.3, Levin S.H., L, Manawatu Challenge S., L-twice, Hawkes Bay Dairy Express Sprint H., PSM Holdings Sprint H., Classic Hits 89FM H., Marton JC NRM Favouritte H., 2d Otaki Maori RC WFA S., Gr.1, Wanganui JC Trust Bank Central S., Gr.3, 3d Waikato Draught Sprint, Gr.1. Winning Endgame (Spectacular Love). Placed, 2d AJC Carbine Club S., L.
SAND SWEEPER (Sandtrap). 15 wins from 1200m to 3200m, NZ$193,900, A$324,030, Canterbury Gold Cup, Gr.3, CJC Easter Cup, Gr.3, Kilmore Cup, L, 2d MRC Easter Cup, Gr.3.